Regular readers will be aware that over the last couple of years I became a fan of Irish singer/songwriter Niall Breslin, better known as Bressie. After an excellent debut album "Colourblind Stereo", I had high hopes for his career. He joined the panel on The Voice of Ireland which brought him to the attention of a new audience. However, "Rage and Romance" proved to live up to that 'difficult second album' tag and in my 2013-50 post at the end of last year, I said: "Bressie's second album was one of my most long-awaited in a long time, yet it failed to live up to the anticipation. The first single from it, the glam rock-influenced "Show Me Love" only managed to scrape into my chart, and despite his continued exposure as a judge on "The Voice of Ireland" I just wonder where his solo career will go from here". Last week, that question was answered. Bressie announced on his website http://www.bressiemusic.com/ that he is 'parking' his solo career for the foreseeable future. He went on to say that he never fully settled as a solo artist and preferred his time performing with previous band The Blizzards. Once again, thank you sincerely for your support and understanding and I promise you that I will be performing and making albums at some stage in the near future." 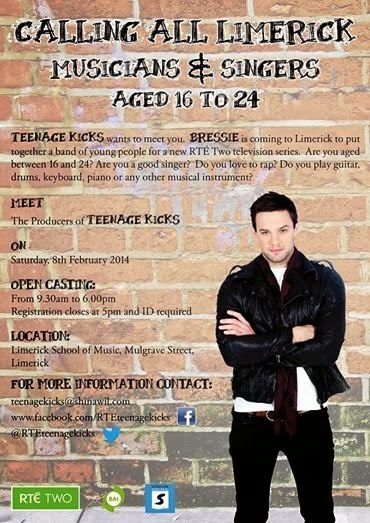 Teenage Kicks is a new RTE show which will follow Bressie to Limerick to form a new band. Bressie, I wish you well in all your future plans and adventures, developing and supporting new talent...and hopefully you'll return to the recording studio some day. All the best! ...and more wonderful wonderful travel news! We are finally going to Copenhagen for a short break in May! All those years ago when we started going on city breaks all over Europe, Copenhagen was always one of the original destinations on the wish list, but for various reasons we never made it there. After developing a bit of a Danish obsession over the last couple of years, I'm really looking forward to discovering the capital city and time permitting, maybe even travelling on "The Bridge" for a day trip to Malmö! Of course there is something big happening in Copenhagen in May, but we won't be there during Eurovision week, for a combination of reasons which I won't bore you with here, but one of them was that the hiked-up hotel prices would probably have blown our holiday budget for the year! Anyway I'll just be happy to read about all your adventures if any of you lovely readers are over there for the contest. Cyprus might be sitting out Eurovision this year, but there's some big personal news to report as we will be visiting yet another new country in 2014. Yes, we are heading for the island of Cyprus in a few weeks to grab some spring sunshine, check out the archaeological and historical high points and of course sample the local food and drink, all in the interests of research as usual :))) and of course there will be the usual holiday report on here with all the usual food photography as you would expect by now!! And more news coming shortly on the next holiday...! Just catching up with some long overdue posts! Apologies as this is almost a month late....! As you all know, Eurovision season, much as we love it, can be a long, frustrating, emotional rollercoaster which will deliver both joy and disappointment. At the beginning of that long road, we had the iconic Albanian Festivali i Këngës, which defiantly existed outwith the ESC mainstream until 10 years ago, when they began sending the winner to the Eurovision Song Contest with varying results since that time. In 2012 I decided to dip my toes into the FiK pool and watch my first ever Albanian national final which didn't disappoint. (The 2012 FiK was also quite moving as it paid tribute to the songs and singers of the 1972 contest who paid the price for being viewed as 'enemies of the state' under the leadership of Enver Hoxha). Fast forward 12 months to FiK 52. As ever, the contest took place over three nights in December, but TVSH messed with the format this year (to the detriment of the contest, IMHO). After each artist performed their competing song, they then performed a duet of a well-known old song with a famous Albanian artist. Over the first two nights, the competing song/duet sequence seriously interrupted the flow. FiK is first and foremost an Albanian song contest, which has existed outside Eurovision for a long time and therefore does not go down the route of trying to find an "obvious" Eurovision" song. That is the particular charm of this particular contest, but it can be equally as frustrating when almost every song is a rather unfocused ballad/mid-tempo song lacking an obvious hook. However, there are also some wonderful things about FiK. The defiantly cheesy theme tune. The orchestra. The opportunity to watch Albanian ad breaks. And in 2014, the return of Luiz Ejlli. Unfortunately "Kthehu" lacked the instantly catchy hook of his previous Albanian entry, but one month later it still gets my vote, although still lacked that 'big finish' required of such a dramatic ballad. While we're on eye candy - special mentions for Klodian Kacani and Lindi Islami - both of whom I would be happy to see in FiK at a later date....! Oh, and so much for the running order - the winning song was the first one sung in the final. Herciana a.k.a Hersi Matmuja brought a 'Kiss From A Rose'-style mid-tempo ballad, "Zemërimi i një nate" (One Night's Anger). I recently read the lyrics of this song and was pretty impressed: "Take away the anger from your heart/every morning is wiser than any night/don’t let the madness of a heart/think a little more, forget this night". The song needs some surgery, although it will probably be translated into something more basic, sanitised, meaningless...which would be a real shame as that would dilute the meaning of the song. Having introduced my mum to the last hour of the competition - which she clearly thought was interminable, although I helpfully reminded her that it had been on for three hours - her view was that Hersi's voice was better than the song. All these weeks down the line, I'm not feeling too hopeful about Hersi's qualification chances, but it would be nice to be wrong!